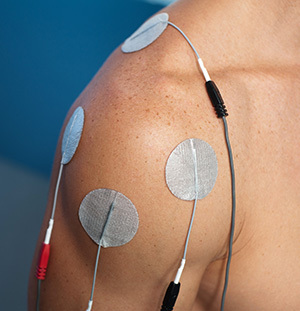 TENS refers to transcutaneous electrical nerve stimulation. It is a portable battery operated device which emits an electrical current via electrodes to the skin. Decreases pain by stimulating the nerve endings which in turn inhibit pain receptors. Increases blood flow as the stimulation of nerves causes vasodilation, and thus accelerates tissue healing. Increases the strength of a muscle as TENS can stimulate a muscle contraction, especially in the case of muscle inhibition from pain, injury or post surgery.